Nothing says summer better than ice cream. 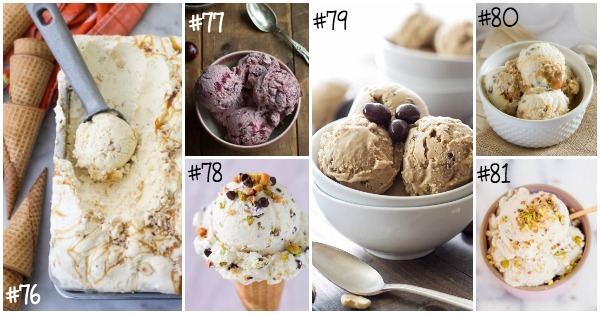 Don’t miss this Ultimate Ice Cream Recipes Guide. From traditional chocolate to raspberry sorbet and everything in between, you’re sure to find the perfect summer treat. Summer is so close now I can almost taste it! I seriously can.not.wait. for long, lazy barefoot days. And nothing says summer better than ice cream, right? 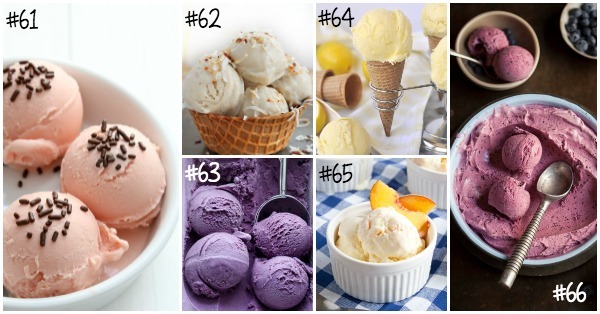 That’s why I put together this HUGE list of ice cream recipes. 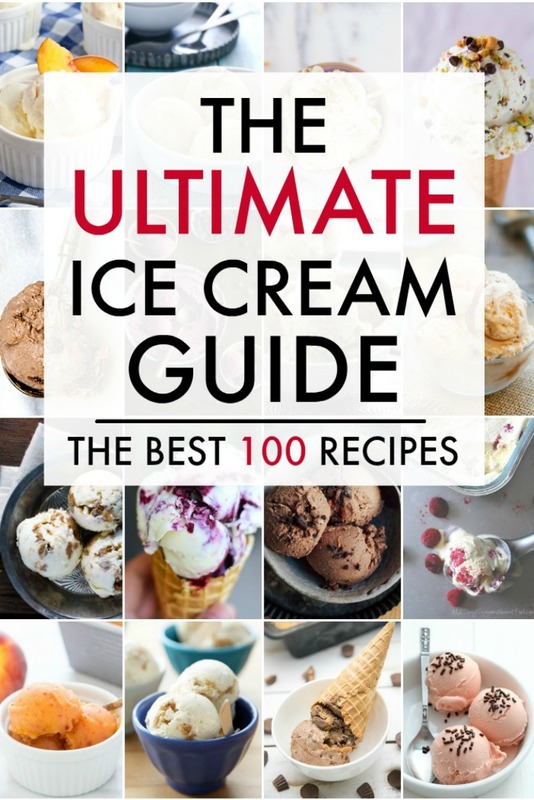 I’m calling it the Ultimate Ice Cream Recipes Guide. It’s the best of the best. 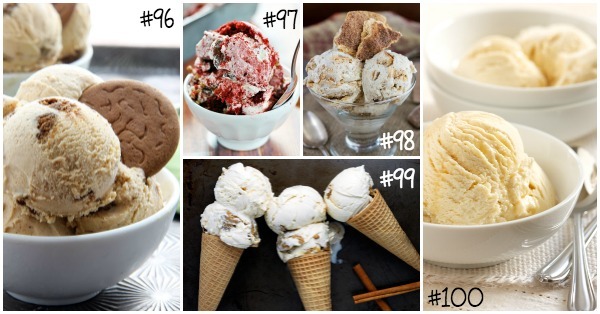 In this Ultimate Ice Cream Recipes Guide you’ll find 100 different ice cream recipes. There’s literally something for everyone; from sorbets to traditional chocolate and everything in between. 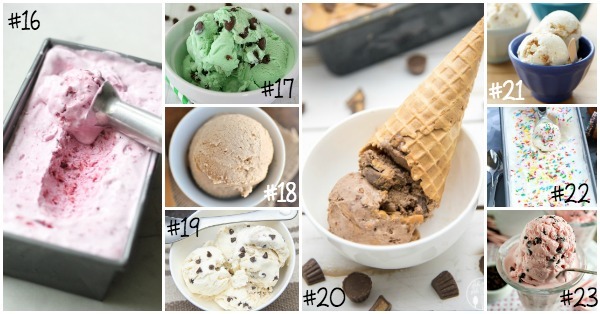 I even share 20 no churn ice cream recipes for all of you without ice cream makers! So make this summer the best yet and try a new flavor every week! 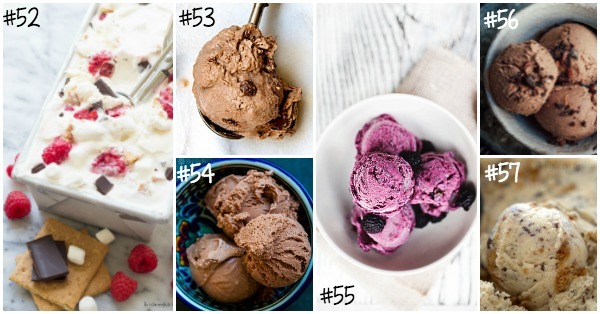 My Ultimate Ice Cream Recipes Guide has you more than covered. 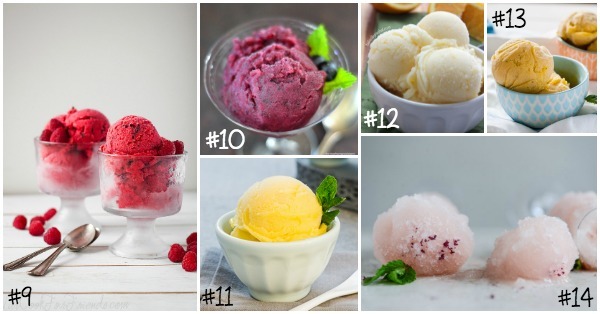 First up in the Ultimate Ice Cream Recipes Guide are Sorbets and Sherbets. I love these for summer because they tend to be lighter and not so heavy. The crisp fruitiness of them is perfect for a hot summer day. Some of the ones I’m most anxious to try are the Raspberry Chocolate Chunk Sorbet, the Fresh Peach Sorbet and the Berry Sangria Sorbet. Yum! 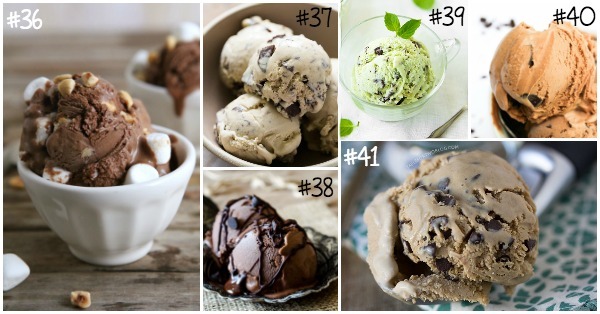 Did you know that you don’t even need an ice cream maker to make homemade ice cream!? 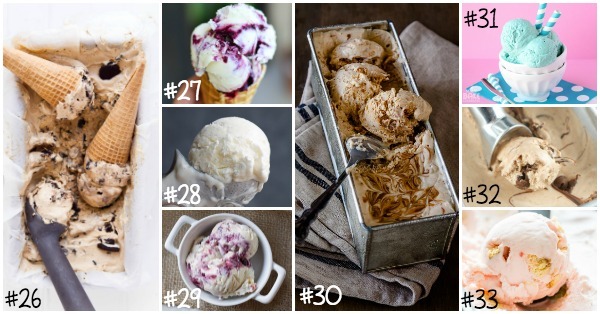 The next section of the Ultimate Ice Cream Recipes Guide includes twenty recipes that don’t require any specialty equipment. More than enough varieties to last the whole summer. 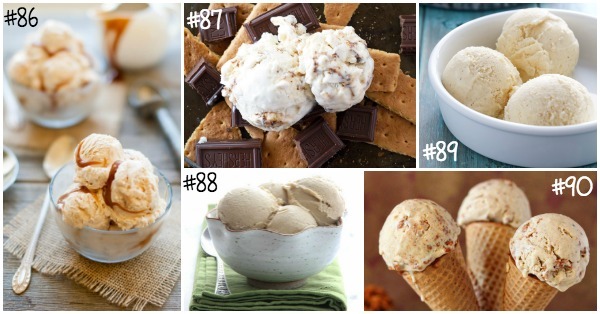 Of course, if all the other recipes in this guide have you drooling, you can grab my favorite ice cream maker here. Chocolate and Ice Cream are just two things that fit together perfectly. They were made for each other. 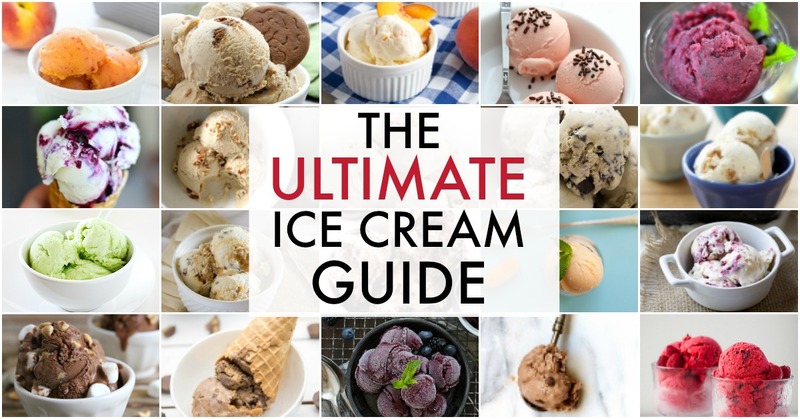 That’s why this Ultimate Ice Cream Recipes Guide has an entire section with your favorite ingredient. You may stick with the tried and true Homemade Chocolate or be super decadent and go for Coffee Bourbon Chocolate Chip. But me? I’ll be dipping my spoon in a big bowl of Black Raspberry and Chocolate Chunk! Fruit Ice Creams are my favorites. Because when it has fruit I can almost convince myself that it’s healthy. 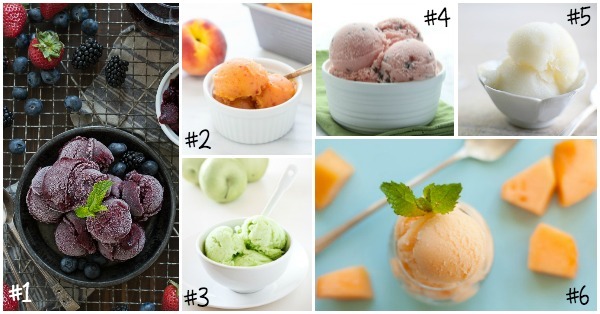 Plus with bountiful, inexpensive summer fruits it’s so easy to whip up a batch. We are going peach picking in a couple weeks and I plan to use some of our haul to make Homemade Peach Ice Cream or maybe I’ll go the fancier route and make Caramelized Peach Ice Cream. But when blueberries go on sale for $.99/pint, you better believe I’ll be making Maple Cinnamon Blueberry Ice Cream! The next set of recipes in my Ultimate Ice Cream Recipes Guide all feature nuts. I grew up loving Pecan Praline Ice Cream. It was a staple in our household. Then my husband introduced me to Buttered Pecan. Don’t tell him but I still prefer Pecan Praline. I also discovered I love Pistachio ice cream and the Pistachio Pear listed here looks heavenly. There’s just something about mixing the sweet cream with a salty, earthy crunch that just makes for yum. 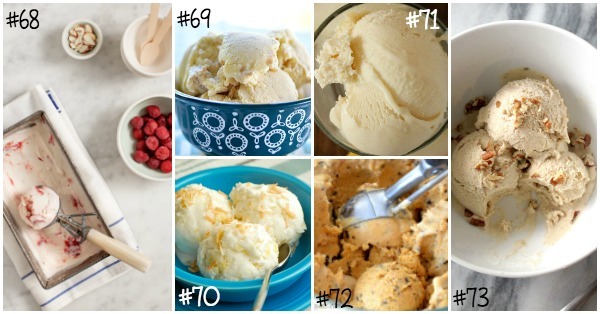 This is the catchall category for the Ultimate Ice Cream Recipes Guide. These recipes don’t feature fruit, nuts, or chocolate as the main ingredient. It’s something else completely. Red Velvet has always been a favorite of mine and I love unusual combinations like Pumpkin Gingersnap. And yes please to Salted Caramel any day of the week! So there you have it. 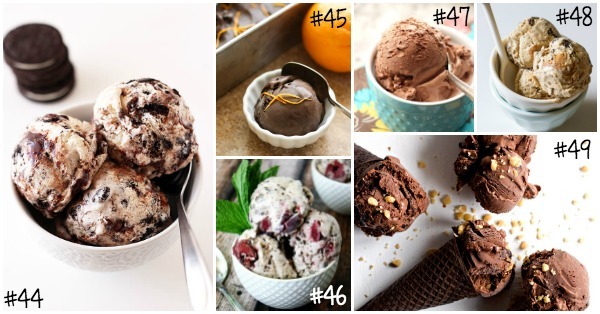 The Ultimate Ice Cream Recipes Guide with 100 different flavors to keep your bowl full all summer long. And really, why stop at summer? Just push on through and enjoy it year round. I mean, who really needs pumpkin pie at Thanksgiving when you could have Pumpkin Chip Gingersnap Cookie Ice Cream? >> Need an ice cream maker? Grab my favorite one here.